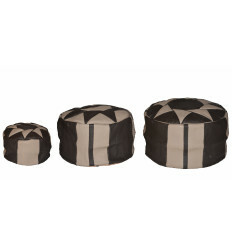 Moroccan ottoman pouffe There are 13 products. Those pouffes are handmade by tunisian artisans. 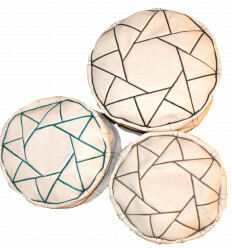 The design of these pouffe is strongly inspired from moroccan leather poufs. Our beanbags are made by hand with real leather. The design and manufacture of modern ottoman remains identical to the original Moroccan pouf.The ottoman round comes without padding. Leather Cowhide Pouf . The moroccan pouf is essential in any room of the house, it can be used to settle above or as footrest watching television. 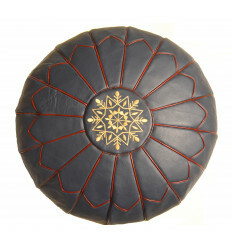 This moroccan pouf ottoman made entirely by hand from goat leather. It gives a modern and elegant look to your living room. 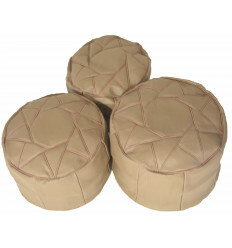 Our moroccan poufs sold without padding because of transportation costs. 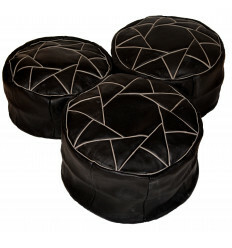 This beautiful two pouf ottoman (Without padding) provides a blend of tradition and modernity to your home. The poufs ottomans are used as footrests or stools. This beautiful round ottoman was manufactured in cowhide. Our round ottomans are sold not completed but you can fill them with old clothes very easily. To create an atmosphere of Arabian Nights to your living room, you need to bet on poufs ottomans. 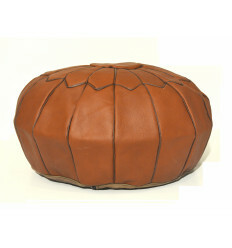 This brown leather pouf was made in cow leather by Tunisians artisans. This will bring you a red ottoman warm atmosphere and a touch of glamor to your home!